Find out who you need to be looking out for in Miami! WODAPALOOZA is about to kick off, are you ready? The 2x Fittest Woman on Earth and Commonwealth Gold Medalist Tia-Clair Toomey is the favourite on the women’s side to take first place. The Icelandic Dottir is ready to challenge Toomey for the top spot in Miami. We're stoked to welcome back America's Fittest Woman, @karipearcecrossfit, to the 2019 stage! Kari took 2nd in 2018 so you won't want to miss this years battle! Grab your tickets with the link in our bio! 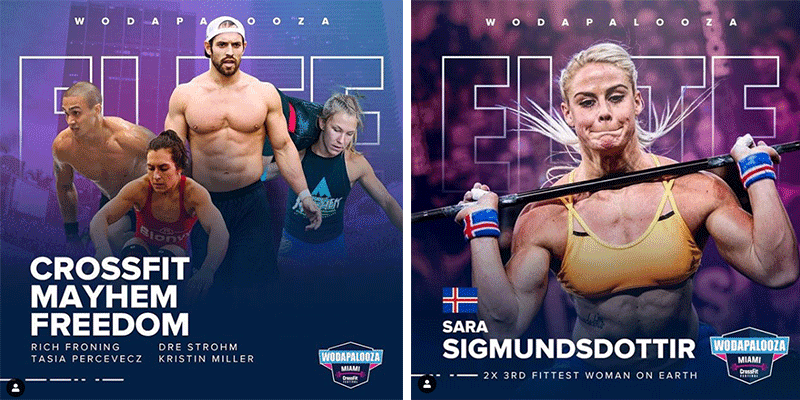 For the first time ever, Norway's Fittest Woman will hit the WZA stage! 🇳🇴 ⠀⠀⠀⠀⠀⠀⠀⠀⠀ 7th at this years The CrossFit Games @holtekristin will be looking to sit atop the podium in the women's Elite Individual Division. She will be competing individually, looking to punch her ticket back to the @crossfitgames! 4x @crossfitgames athlete and one of your fittest Canadians, Carol Ann Reason-Thibault is "fort comme l'enfer!" ⠀⠀⠀⠀⠀⠀⠀⠀⠀ She will be competing individually, looking to punch her ticket back to the @crossfitgames! In her Rookie year at The CrossFit Games, Ehea finished in 17th position. A strong and gutsy athlete, she will no doubt leave it all out on the floor in Miami. We're really excited to add two @CrossFitGames rookies to our Elite Women and Men's Divisions!